We are pleased to present you with our new and updated website. This new website will allow you to take our 2009 census right from the website. Other surveys and data record sheets can be downloaded directly from the website and returned to us once completed. This is very exciting for us. Look for more surveys to be added in the coming months. We appreciate all of those who have participated in the surveys in the past and hope that you will continue to participate in increasing our knowledge base. We can't do this without YOU. You can now take the Allergies and Intolerances Survey directly from the website! 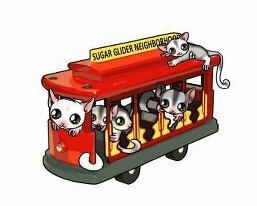 1) To collect scientific data on sugar glider anatomy, death and physiology through the collection and analysis of necropsy reports and a necropsy survey. When the SURVEY is combined with the necropsy report, the picture becomes even more clear. We are afforded a great deal of additional information by matching necropsy results with the survey. This is one of the methodologies that causes the SUGAR Group’s research to stand out and makes our research unique. 2) To encourage owners to consider having a necropsy (and histopathology) any time one of their beloved gliders passes away by reimbursing a portion of the cost of the procedure(s) for anyone who completes our survey AND provides us with a copy of the reports. The SUGAR Group has a working relationship with a pathologist and we are able to match the owner’s cost. For a necropsy AND histopathology, the owner’s cost would be $50.00. All reports are then sent to the SUGAR Group and entered into our database for future study. All results are stored in 3 different places so that they are never lost to this community. Owners who wish to take advantage of this, may contact the SUGAR group through our website http://www.sugargroup.org. You may also participate in the study by sending in necropsy reports from past necropsies. We learn from each and every necropsy performed. Collectively, these reports are helping us to put together a comprehensive picture and to make recommendations for treatment. Even more significant to owners is that the necropsy reports in combination with the surveys are helping us to put together a list of symptoms that one might see BEFORE a glider becomes terminally ill, so that perhaps we can begin to treat some of these conditions and prolong the healthy lives of our gliders. This is an important project, and one that is very near to the hearts of many. For more information on The SUGAR Group and its projects, visit their website! Did you know that the SUGAR Group creates a memorial quilt ( http://www.sugargroup.org/Memorial-Quilts.html ) each year to honor those gliders who have passed away? You can purchase a square to honor your glider AND support the Necropsy Effort ( http://www.sugargroup.org/Necropsy-Effort.html ). Check out the March 26th show! All about gliders. Segment 4 has our very own Val Betts talking about The SUGAR Group.